After installation the contents of an MLA installation directory will look like the one below. Four of the subdirectories are used for graphics projects. Graphics Projects supplied by Microchip contain a single system configuration subdirectory for each project configuration. Each of these subdirectories contains at least two files: system.h and system-config.h. These system config directories are locate in the folder: <your project>/firmware/src/system_config. 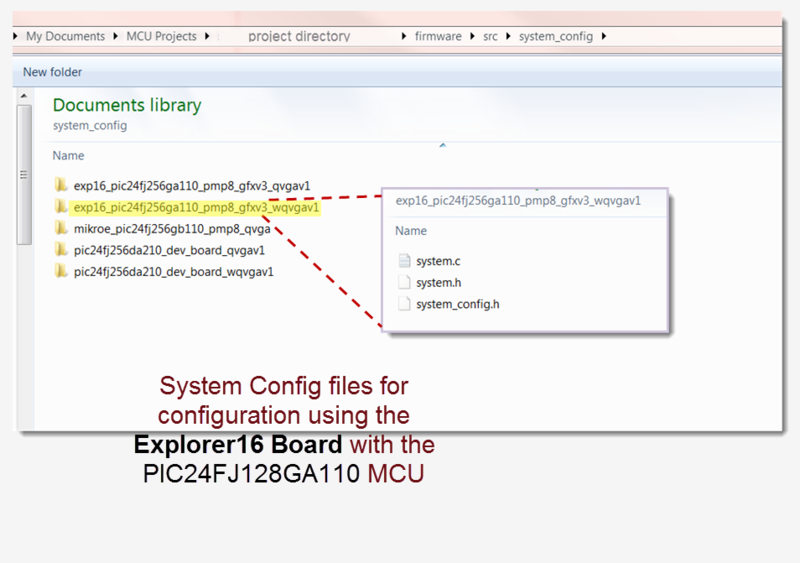 In Microchip supplied projects these subdirectories are in the project tree, however only the subdirectory for the current configuration is included in the project. system-config.h contains display specific information needed by the driver. Among the information contained in this file are the screen resolution and control signals needed to drive the display. When changing to a display not supported by the Microchip Graphics Library you will need to modify system-config.h to define the display properties. The compilable source code and header files for the graphics controller drivers are located within the /framework/driver/gfx subdirectory. Microchip typically places all the driver source and header files in every project tree. The driver source files a located in the project tree under Source Files/framework/driver/gfx. The driver header files are located in the project tree under Header Files/framework/driver/gfx. While all the files are present in the project tree they are not all included in every project. The driver files for a particular graphics controller are included into a project based upon the configuration selected. In order to port an application to a platform which contains a graphics controller not supported by Microchip, the functions supplied in the device drivers will need to be replaced with drivers supplied by the developer. These functions include DRVgfx_Initialize, DRVgfx_ImageDraw, GFX_PixelPut GFX_PixelGet, GFX_PixelArrayPut, GFX_PixelArrayGet, GFX_RenderStatusGet. 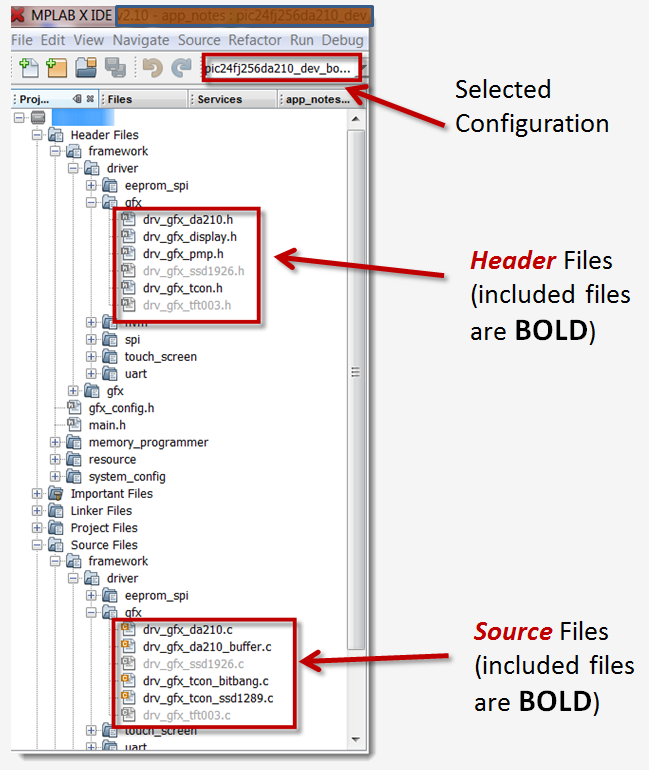 Consult the individual header and source files for a complete list of functions needed. Graphics projects contain a project-specific configuration file called gfx-config.h. This file is #included into the project and is used during the compilation of the project. The file contains a series of #defines's which instruct the compiler to enable or disable graphics specific features in the compiled code. To work with a multi-tasking environment, Microchip’s MLA graphics library functions which draw primitive graphic elements can be compiled with one of two attributes: Blocking or non-Blocking Mode. When compiled as Blocking Mode, the drawing functions called by the MLA will presume to have completed their function when they return (i.e. the function is called, runs to completion, then returns). 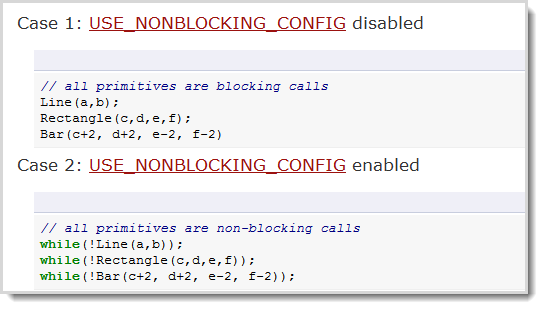 Blocking mode is the method in which most embedded programmers first learn to program. In Non-Blocking Mode, the user must realize that the system may take control of the task before completion and there is a possibility that an MLA function was not completed. In Non-Blocking mode, primitive gaphic drawing functions will return a ‘1’ when they complete their function and a ‘0’ when they are unfinished. Users who program in Non-Blocking Mode should test the primitive graphics funcions to verify they have finished executing. Most coding examples used in this tutorial use the simpler "Blocking Mode" syntax and flow.